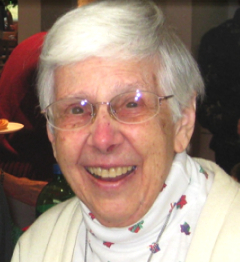 It is with a mixture of sadness and gratitude that we announce the death of Sister Ruth Held, acj. Sister Ruth, a member of the Handmaid community for more than seven decades, died peacefully on Tuesday, October 25th, with members of her Handmaid community present. Sister Ruth Jane Held, acj was born in Philadelphia, Pennsylvania to Barbara Waldenberger Held and Leonard Held on July 21,1920. Her close family were her beloved brother Robert (Bob) and her sister, Sally Held Sharkey, with whom she had a profound spiritual connection in the Catholic faith. After graduation from John W. Hallahan Catholic Girls’ High School in 1938, she worked some years before entering the Handmaids of the Sacred Heart of Jesus as a postulant in Cuba, on September 8, 1941. Admitted to novitiate on March 9, 1942, Sister Ruth made temporary profession of vows in Cuba two years later and returned to the United States to pursue her Bachelor of Arts degree in English at Rosemont College, followed by her Master of Arts at Villanova University. Sister Ruth made perpetual profession of vows on August 15, 1950, in Wyncote, PA. She became a teacher of Religion and English, and served as Principal of Ancilla Domini Academy, a high school in Germantown, Philadelphia, from 1953 through 1961. During her tenure there, she taught many young women who would later embrace their vocation with the Handmaid community. Also during this time, Sister Ruth served as Superior. In 1967, Sister Ruth began teaching at the School of Saint Basil the Great in Kimberton, PA, where she also served as Principal. She remained there until 1971. Following her teaching career, Sister Ruth became involved in retreat ministry, working at Saint Raphaela Center, in Haverford, PA from the 1970’s through 2012. During this time, she also served as treasurer of both the community and Retreat Center, and also as the Provincial Secretary.